The location of the learner, the time they can participate, the pace they want to go through the content and the device they want to use, should under no circumstances impact a learner today. Damgeo will enable you or your organisation with targeted digital learning content and a streamlined infrastructure, that will engage your modern learners to become the best. Damgeo are leading the way with learner analytics through Experience API (xAPI / Tin Can API) implementations. Damgeo can put in place systems that will enable you to collect data about the wide range of experiences a learner has (online and offline), not just if they have passed a multiple choice test or viewed the content. Damgeo will complete regular trawls of the www for engaging and insightful articles on digitisation, education technology and ePedagogy, find our highlights below. Learning Light: 2019 eLearning Trends & Leading Technology Solutions (08/04/2019). Learning Technologies: Understanding leadership in a digital age (24/03/2019). Pedestal Search: Getting your digital knowledge to be shouted out by Google Assistant (13/03/2019). eLearning Industry: Enhancing Training Through The Right Use Of Technology (11/02/2019). Learning Technologies: Learning technologies: understanding what’s hot, what’s not and why (13/01/19). eLearning Industry: 5 Ways A Custom eLearning Solution Can Increase Employee Knowledge Retention (02/01/19). Learning Light: Learning Technologies 2018 Preview (24/12/18). Learning News: David Wilson on learning systems (19/11/18). Learning News: Learner Needs Drive New Release (16/10/18). eLearning Inside: Amazon’s Alexa: You Next Teacher (21/09/18). UXMYTHS: Myth #2: All pages should be accessible in 3 clicks (03/08/18). Litmos: Learning’s Role in Digital Transformation (16/07/18). eLearning Weekly Newsletter: Great LMS Marketing Strategy article (16/06/18). eLearning Art: eLearning Trends of 2018 (09/05/18). eLearning Industry: 4 Tips And Examples Of Great Web-Style eLearning (05/05/18). Wired: eLearning: It’s time for a rebbot (22/04/18). E-Learning Heroes: Apply UX Design Principles to E-Learning Courses (21/03/18). Learning Solutions Mag: This is an awesome integration article using xAPI & Alexa, dead easy to do, you don’t even need Alexa hardware, just a mic (01/03/18). Scholar LMS: Switching From Traditional To Online Training: 8 Expenses You Can Eliminate (08/02/18). Employee Onboarding: The Importance Of Choosing The Best LMS For New Employee Onboarding (25/01/18). Allen Communication Learning Services: 6 ways to take the tedium out of employee induction training (24/01/18). The Guardian: Learning analytics don’t just measure students’ progress – they can shape it (18/01/18). E-Learning Heroes: The best of 2017: The 10 Most Viewed Storyline Examples (06/01/18). Creative Bloq: Sister publication of net Magazine. This is a brilliant web design-focused blog (02/01/17). LinkedIn: 80% of training fails – use the full learning transfer model to ensure 100% success (12/05/17). Wired: Shoot 360 Video Like a Pro in 6 Simple Steps (21/05/17). Synergy: UX is all about the ‘User’ and the ‘Experience’; fully understanding the users needs and goals is key (11/07/17). Engadget: Microsoft upgrades Paint 3D’s drawing and magic select tools (12/07/17). Engadget: Google tests VR as a replacement for dull training videos (21/07/17). Kallidus: The Changing Face of Millennial Learning Habits (14/09/17). Kineo’s stream of thought: The team discuss the much publicised death of Flash, from a designer, technical and end user perspective (03/08/17). Agile eLearning Development: To help instructional designers better achieve success, we developed the Successive Approximation Model (SAM) (12/10/17). Course Navigation: 5 Examples That Take Course Navigation in a New Direction (03/11/17). 5 Reasons: Using The Fibonacci Sequence Makes You Better At Agile Development (08/11/17). I know we say this every month, but some more exciting announcements at DAMGEO LTD this month. 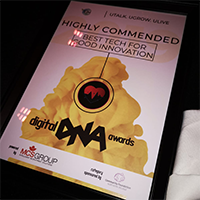 After being highly commended at the Digital DNA awards with the amazing UHUB (behind the mighty All State) and 10 of the team attending the DANI Awards. We are very excited to announce the kick off of 4 new innovative and exciting projects at DAMGEO LTD. These new clients (prefer 'partners') are WE ARE PROUD, CENTRED SOUL, DEIRDRE MAGUIRE and FIONA BRADLEY. In addition, our long term projects with ACUMENSIS, MOY PARK, CHILDREN'S LAW CENTRE, UHUB and VOLUNTEER NOW continue into new phases and further projects in Q2 of 2019. Finally, promise, our founder Damien Caldwell is very excited to be a part of the discussion panel at the #SMARTTalent19 at the Eurpoa on May 16th. More details here. 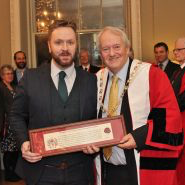 We are very honoured this month, to have our own Damien Caldwell, become a freeman of the WORSHIPFUL COMPANY OF MANAGEMENT CONSULTANTS. This deserved recognition comes after our innovative digitisation work within the third sector, with organisations such as UHUB, CHILDREN'S LAW CENTRE, VOLUNTEER NOW & KITH & KIN. As we move into 2019 we are delighted to announce the continuation of our exciting long-term projects with UHUB, CAPITA, CHILDREN'S LAW CENTRE, SEVERFIELD, VOLUNTEER NOW & KITH & KIN. 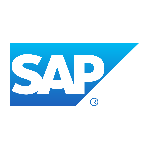 After a successful and groundbreaking project with MOY PARK in 2019, we are delighted to announce the kick off in January 2019 of a second expansive project with MOY PARK and the wider JBS GROUP, providing the dynamic and interactive online learning content and infrastructure for the rollout of the SAP ERP solution - in partnership with ACUMENSIS.